Let's explore a world where war continues therein. Meet more than 400 types of monsters and fill out your winnings at Sky Arena. 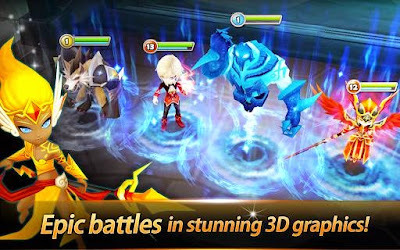 Android games this one has supported 3D graphics, every detail will contain stunning beauty. As I said earlier, there will be more than 400 monsters, but strangely you will collect the character of those monsters, a collection of all of them and their attributes, such as fire, water, wind, light (light) and dark (darkness). 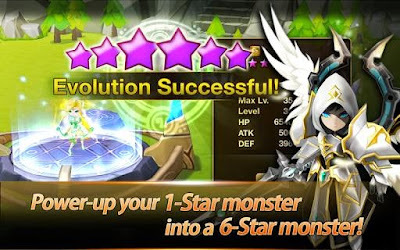 Do not forget to upgrade the monster, of which only have one star, upgrade to be a 6 star, complete with power-ups anyway, evolution and skill power-ups. 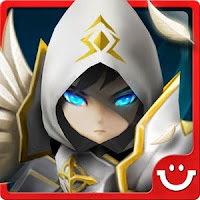 Decorating your village, Fight with new challengers, do battle every day, collection of monsters and many more that you can do in the game Summoners War: Sky Arena this. This game is free .. tis .. tiss, and supports multiple languages, including English, Deusch, Franch, Portuguese, Spanish, Thai, Indonesian, Malay, Vietnamese, Chinese, Korean. So you need not worry if confused with the English language, use only mode Indonesian. Not good.